Celebrate the end of summer in the company of other families from the Community! 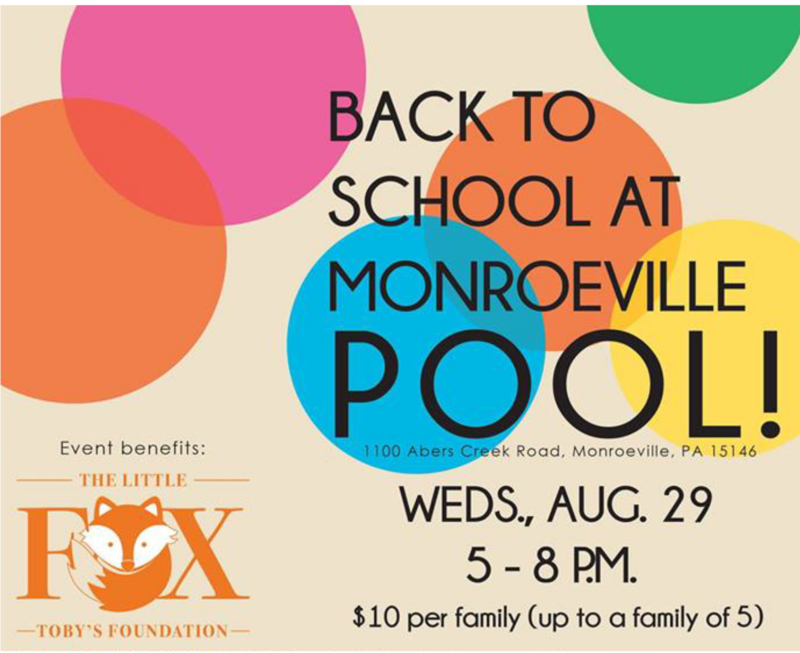 The Little Fox – Toby’s Foundation is partnering with the Monroeville Pool, Monroeville Parks & Rec, and Dad’s Pub and Grub to host “Back to School at Monroeville Pool” on Wednesday, August 29! We will have a dunk tank with participants from the community will be “sitting” in to raise funds for The Little Fox – Toby’s Foundation! We’ll have Children’s Activities, Dad’s Food Truck for dinner, Open Swim and a number of Raffles/Giveaways for kids & adults! $10 is the admission for an entire family and includes swimming and kids activities. Dinner can be purchased at Dads Food Truck and we will also have tickets for purchase for a number of raffle baskets – kids, adults, families – all evening long! Event sponsors include: Western Pennsylvania Appraisal Services; Monroeville Chrysler Jeep; Allegheny Health Network – Forbes Hospital; Valley Honda; Trifecta Graphics; Serving Other Souls; Gateway PTO – THANK YOU!!!! We have sponsorship opportunities available so if you or your Company are interested in supporting this Community event – email us at thelittlefoxfoundation@gmail.com.